On November 15th, 2015 in Melbourne, Australia, Bruce Buffer introduced Ronda Rousey to a packed out Etihad Arena as the women’s bantamweight champion of the world. The UFC superstar and cultural phenomenon had never been beaten in MMA and was one of the most recognizable faces in the world of sport. It took just two rounds into her title defense against ex-boxing world champion Holly Holm for that to end. Since that spectacular dethroning, the name most female MMA fighters once feared to speak no longer holds the currency it once did. So what happened? 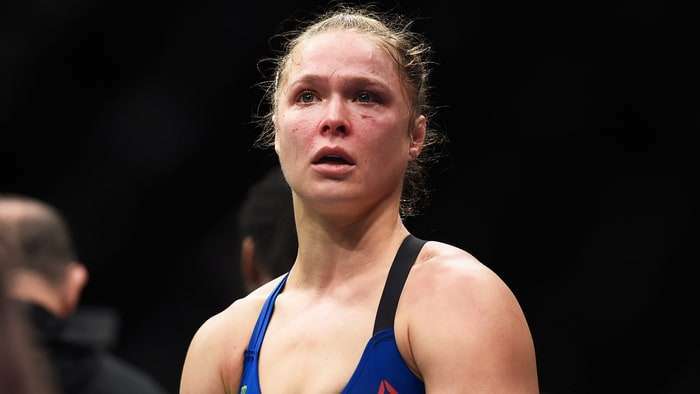 Quite simply, Ronda was dominated at UFC193 and could not bounce back. The loss affected the former Strikeforce champion severely, and this coming Friday will see her return after a long hiatus. Another question which hangs over the partner of UFC heavyweight Travis Browne is the quality of the team which she has around her. Rousey’s only defeat inside the octagon is attributable to a fight plan which was embarrassingly one dimensional, and highly simplistic. Edmond Tarverdyan’s baffling tactics were effectively to pressure and hunt down an accomplished long-range striker [in Holm] to beat her on the inside. It was clear by the end of the first round that not only would this game plan not work, but it was being completely exploited by the former WBC champion of the world. Tarverdyan had no plan B or deviation from tactics which were clearly not working (he even bizarrely commended his fighter’s efforts). The gapingly obvious failure here was that Rousey was not squaring up against a run of the mill, flat-footed slugger; Holm was (and is) a proven, technical striker with great footwork. “The Preacher’s Daughter” employed powerful straight lefts from the outside and slick lateral movement; such simple boxing fundamentals appeared far more impressive given the opponent’s inability to find a way inside. “Rowdy” could only move forward, and in a straight line, and was ill-prepared for a challenger with a southpaw stance. With no concept of space management, or timing strikes, a fighter will eat solid punches trying to reach their target. In Rousey’s case she was picked apart, worn out and eventually opened up allowing Holm the window to connect with a perfectly timed head kick which knocked her out. The shocking defeat not only exposed arrogance in the Glendale camp’s preparations for the match-up, but was detrimental to their fighter’s health. If the the Queen of MMA’s first “L” painfully highlighted limitations in her striking abilities, it certainly confirmed one thing: Holm is a boxer; Rousey is not. Prior to her loss in Australia, “Rowdy” displayed a peerless aura of invincibility. Many called for her to be declared as the pound for pound #1 in UFC, while others suggested that she possessed the skills that could beat male fighters. Before Conor McGregor, Rousey was the muted cross-over opponent to fight Floyd Mayweather. While the accolades, superlatives and hyperbole which surrounded the iconic fighter had never been seen before, the magnitude of her fall from grace will possibly never be seen again. Having reached peak popularity, and with a string of acting roles, advertisements and product endorsements, the 135lb champion watched her stock collapse dramatically. Speculation mounted on exterior commitments (mainly acting) as a distraction from her fight game, and ultimately affecting her preparation and her dedication to the craft which had made her famous. A retreat from public life led to speculation of retirement: would she ever step foot inside the octagon again? Further talk of depression and suicidal tendencies (concerning, given that both her father and grandfather took their own lives) added weight to the argument that we had seen the last of the bantamweight in the UFC. No one had yet to establish themselves in the absence of the Beijing 2008 medallist until Nunes took the strap from Tate. Since UFC193, the women’s bantamweight division had seen the belt change hands three times in as many fights. Miesha Tate, the now retired (one time) nemesis of “the arm collector”, earned the strap via rear-naked choke from Holm at UFC 196. “Cupcake” would subsequently fall victim in her first title defense against Rousey’s next opponent Amanda Nunes at UFC 200, suffering the same fate she had dealt Holm the previous March (rear-naked choke). From there on, the Brazilian has looked a tough champion. The American’s MMA debut victory came in March 2011 against Ediane Gomes at KOTC: Turning Point (submitting her opponent in 25 seconds). A further six victories would come via armbar, and all in the first round. At UFC 170, almost three years and eight fights later, Sarah McMann collapsed following a knee to the body – the first fight Rousey won via strikes. A fluent left knee gradually softened the body, until McMann hit the canvas after the first minute of the first round. At UFC 175 the following July, Alexis Davis was the next victim of the female superstar and lasted only 16 seconds in spectacularly brutal fashion. Rousey, looking more the stand-up fighter, landed a couple of jabs and straight-rights, before hip tossing her opponent and demolishing her with several blows on the ground. Despite this, Cat Zingano would fall victim to the signature armbar at UFC184, but a return to a strike oriented game plan at UFC190 was enough to flatten Bethe Correia via a right-hook.